Students split into small groups and rotated through four different areas of the company. At De Nora Water Technologies, Inc., mechanical and chemical engineers work on developing and manufacturing disinfection and filtration systems to provide safe water sources for sites around the globe. 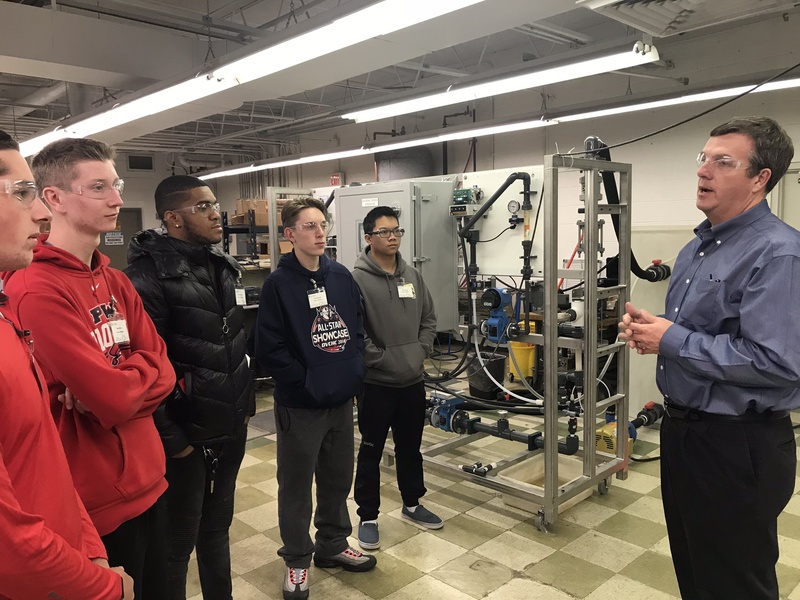 Recently, the company welcomed students from Plymouth Whitemarsh High School (PWHS) for a taste of what a career in engineering might look like. “The De Nora Career Day showed us how what we do in class is applied in the real workplace,” said student Aiden Chuang. “We saw everything from the initial phases of the design process to detailed computer models to the creation of the final physical product.” After getting an overview of some of the the company’s unique products and technology from De Nora Managing Director Daryl Weatherup and Project Technology Manager Stan Shmia, the students split into groups and rotated through four different areas: Applications Engineering, Project Engineering, Drafting and Computer-Aided Design, and the manufacturing floor. “It was interesting to see how the tools we use at school were also used at De Nora, such as the 3-D printer,” said student Felix Raimondo. “The time at De Nora solidified my interest in engineering.” Students who signed up for the trip have taken courses like engineering, computer programming, product development and robotics. Through project-based learning in their classes, they work in teams to use the engineering design process to solve problems, create prototypes and gain their first experience with professional tools and programs like AutoCAD and Inventor.